The Great Pyramid of Egypt. Climb the mummy mountain. 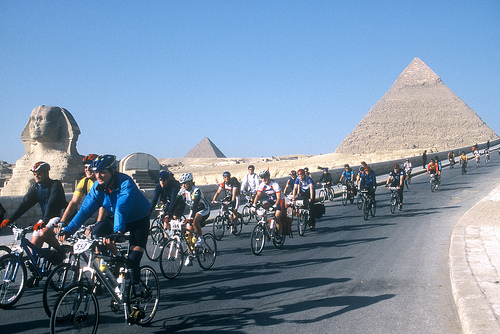 The great pyramid hill climb. You want to test your climbing legs? 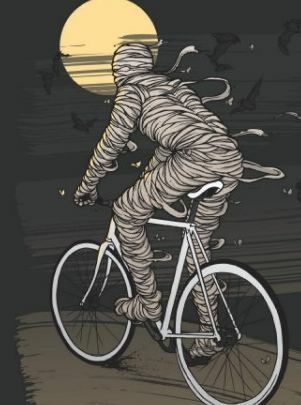 Get that “the-mummy-meets-Alpe d”Huez kinda vibe? Then the Tour d’Afrique, the world’s longest bicycle event, is your your next masochistic challenge. Riders from all over the globe are stress-testing their limits in this four month, 12-thousand kilometer race and crazed expedition from Cairo to Cape Town. The journey will take you across ten African countries (Egypt, Sudan, Ethiopia, Kenya, Tanzania, Malawi, Zambia, Botswana, Namibia and South Africa.) Should you somehow survive until the end, you’ve got serious bragging rights over your buddies on the usual Saturday morning ride. The most exciting climb is the short but brutal ascent from the base of the Great Pyramid to the top: a full 450 feet and an impressive 10% grade. Bonus points if you do a wheelie on the tip top. Egyptologists warn that riders may be cursed should they attempt the climb but rumor has it that Harrison Ford did the climb in his Raiders of the Lost Arc days. It’s man versus mummy mountain. You game? « Mario Cipollini launches his own bike line. The Super Mario velo.